Citizens and planners should respect the mobility of handicapped persons by ensuring that infrastructure is accessible to all. Photo by Eneas De Troya/Flickr. Every morning for the last six months I have observed the same man parking his car in the handicap spot. At first, I flashed him angry and annoyed expressions to try to convince him to park somewhere else; no results. I proceeded to leave post-it notes on his windshield that said: “RESPECT, this spot is reserved for handicapped people.” After this failed to have any impact, I decided to talk to him directly, to which his response was, “if you don’t like it, it’s not my problem.” Finally, I decided to go to the authorities. Their answer: “he is not bothering anyone.” They have not and will not do anything about it, and the man continues to park his car in the same handicap spot. Does the inappropriate use of reserved spots, ramps, and other spaces really not trouble anyone, or do I have some strange, individual pleasure in seeing them unoccupied? I wondered this then as I do now. Handicap spots and other reserved spaces are not a whim of those who design public transport, parking lots, and sidewalks, or of those who respect their status as “reserved.” These spots are logical measures; obligations that guarantee the mobility, accessibility and safety of millions of people that live permanently or temporarily with a disability. According to the Mexican National Institute of Statistics and Geography (INEGI for its acronym in Spanish) there are 5,739,210 people with some kind of disability in Mexico, equivalent to the population of the states of Morelos, Hidalgo, and Colima combined. Reserved spots in parking lots and seats on public transport are located immediately next to entrances so that the people who require them do not need to go searching, and also to guarantee that they will not have to deal with crowds nor stand for long periods of time. Similarly, the doors on public transport are designed to be wider so a wheelchair, walker, or even a person with crutches can easily exit and enter the vehicle. This is not the only issue that pertains to the need for mobility, accessibility, and safety for disabled persons in Mexico. Less obvious but equally important are the obstacles disabled persons face when planners decide that streets and avenues are not wide enough, eliminating sidewalks and crosswalks. There’s also the flagrant use of sidewalks as parking spots, motorcyclists and bicyclists that ride on the sidewalk, vendors impeding footpaths to sell food, groceries or accessories (formally or informally) to people waiting to cross the street; and property owners that create mountainous ramps in the middle of the sidewalk in the name of creating a driveway. On top of this is the lack of voting ballots available in Braille, ramps instead of stairs, clear signage with easy-to-read language, functioning escalators, clear and simple information at transport stations and stops, and drivers who are aware of the impact abrupt acceleration and braking has on the body. The only way to counteract this history and help disabled persons overcome their mobility barriers is through financial policies, education campaigns, and urban design that prioritize mobility for all residents. It appears Mexico may be headed this direction. The recently announced “Mexican Charter of Pedestrian Rights” centers on people regardless of gender, age, or condition, and reinforces that this issue is not a matter of preference or nuisance; it’s about individual rights. 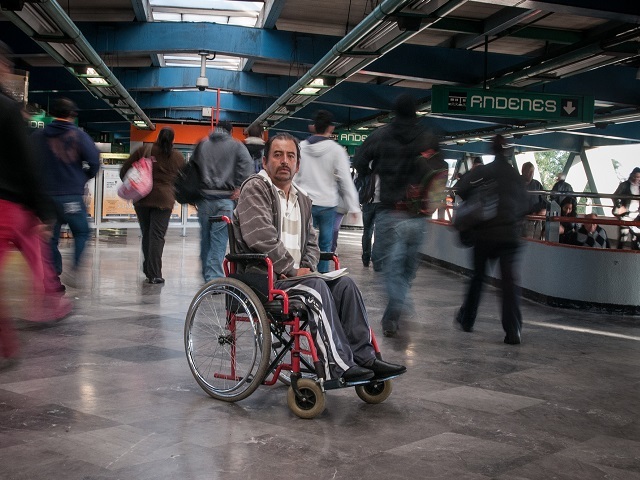 Note: According to the International Convention on the Rights of Persons with Disabilities; “accessibility” (Article 9 of Mexican Constitution) refers to ensuring that people with disabilities can access their environment, transportation, facilities and public services, and information as well as technologies and communications; i.e., identify and eliminate obstacles and barriers that limit accessibility. Lillian Sol Cueva is the Air Quality and Climate Change Coordinator for EMBARQ Mexico. This article was originally published in Spanish in Forbes Mexico.